Improved water reliability and lifecycle costs through total control of a one hundred mile transfer system. Around the world there is a renewed focus on the future of water availability. In many arid areas water desalination is increasingly being used to save the small amount of potable water. Minera Escondida, one of the world’s largest copper-producing mines, is located in the Atacama Desert, one of the driest in the world. BHP Billiton, the owner and operator of the mine, was faced with the challenge of eliminating the use of lake water and natural resources from their mining process and re-routing their water supply to a new desalination plant. The area’s unique topography, with a steep elevation from sea level to hills, poses significant pressure management, pumping challenges and also significant energy and water capacity needs. BHP needed a reliable control solution to increase energy efficiency and productivity with high reliability and low life cycle cost. 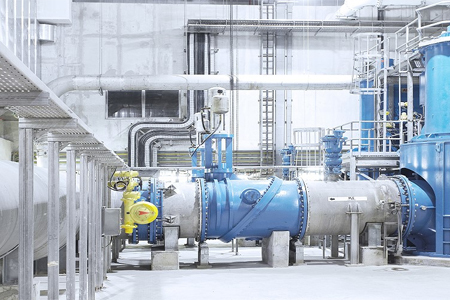 The ABB Ability™ solution for pumping and transmitting water has helped the water pipeline owner to ensure energy efficient and reliable water supply from the desalination plant to the vast copper mine. The solution includes a central control system for the 177km and 2.5km elevation rise water transfer system, 4 large pumping stations and 36 high pressure pumps, a seawater desalination plant control system and system design. The complete solution coordinates the overall operation of the entire Minera Escondida mining process. From seawater desalination to the water supply to the mining process, the result is a total solution to completely optimize the energy efficiency and performance of the plant. ABB Ability™ solutions for water supply address the challenge of short-term and long-term operation planning by providing tools for performance monitoring, performance optimization, water management, pressure management, simulation, vibration monitoring and pump efficiency.